Paula Hayes has teamed up with floral stylist Lindsey Taylor to put together some new stunners as spotted at www.apartmenttherapy.com. My favorite is the orchid cubed, as pictured above. I wish they had a close up photo of the arrangement - it looks like a well done little topographical wonder. Every time I try to design rolling hills they just look like lumpy moss. I'm also very intrigued by the apparently slim charcoal/soil/gravel layer. It looks like a scanty amount of soil for such a thriving plant layout. But it certainly adds to the minimal design. Very haute. 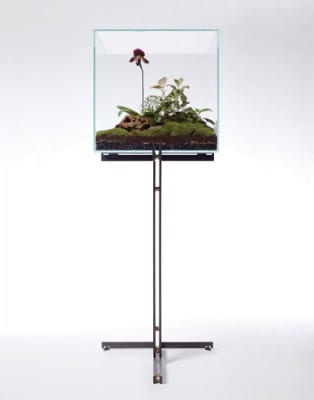 I SWEAR that, included in my next 4 terrarium designs, I have been working on a cube terrarium with an orchid (I won't have the layers exposed). Gorgeous. That would look so good in my flat (if I had the room!). Not sure but I don't see the plants in the photo needing that much soil...certainly not the orchid. Due to the angle it's hard to get a sense of dimension for that terrarium. Is it a cube? Caynazzo- do you have a flicker set of your terrariums? I feel like maybe you sent me an email with the link one time and I completely accidentally deleted it. If it wasn't you- I apologize for the error.... they were just so damn cool.